The Director of the Simson’s movie has a Flaming Tuba. 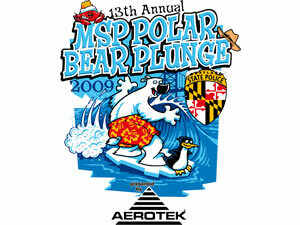 A team from The Zoo is doing the Polar Bear Plunge on January 24th, 2009. Kim got suckered into eagerly agreed to participate. Since this benefits the Special Olympics of Maryland, this is a donation activity. If you’d like to donate, her donation page is here. Any amount helps! Even if you don’t want to donate, come out and watch the crazy people brave plungers do their thing! 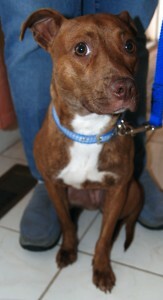 This is the newest addition to our Pack – Ginger Gayle. Kim found her running loose in Druid Hill Park in Baltimore, MD. After following her and feeding her for 3 months, they finally got a hold of her and we were able to bring her home. Clean bill of health by the vet, and she fit in amazingly well with the rest of the critters here. You know it’s “Winter” in the mid-atlantic when yesterday it was 65 degrees out. And today it’s 36. And they’re forecasting an ice storm. New battery in the truck, full gas can for tractor and snow-thrower, and ~500 lbs of rocksalt in the shed.